For a British person of a certain age, playing We Happy Few is like being spoonfed your own sick. I intend this entirely as praise. To be more specific, it’s like being spoonfed sick originally vommed up by King Arthur and stored in a vase for centuries at Windsor Palace, chewed over by Winston Churchill, shipped to the New World alongside the Beatles and Pythons and hereby returned to us with sprinkles on top by Canadian studio Compulsion Games. By “sick” I of course mean Great British culture, that terrible extent of table manners, bucolic landscapes, desperate irony and colonial nostalgia that has come to serve as a key export in the absence of our old manufacturing industry. 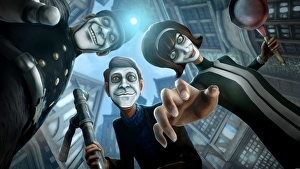 An uneven yet fascinating first-person role-player that mingles elements of immersive sim design with open world survival mechanics, We Happy Few is a love letter to all this, and – well, let’s just say the letter isn’t written in ink. Set on the procedurally generated island chain of Wellington Wells during an alternate history in which World War 2 ended rather differently, it presents a dystopian society built around an idealised composite of Englishnesses – the keep-calm-and-carry-on propaganda of the Forties, the growing consumerism of the 50s, the sugary tunes and hedonism of the 60s. Riffing on the films of Stanley Kubrick and Terry Gilliam, the portrayal is absurd, fulsome, both dainty and menacing, with all manner of sceptred arcana popping through the seams of its tweed jacket as it brings a cudgel squarely down on your face. Head to the Parade District, the game’s most affluent area, and you’ll find candystripe roads, stooped cobblestone houses and tar-beamed pubs tucked in amongst modern residences with space age furniture. Citizens – their high spirits and homogeneity ensured by mandatory white masks – play hopscotch, cuddle on benches, march up and down jauntily with elbows akimbo, trade morsels of village gossip. Did you know the circus is coming to town? Have you heard about Constable Rossetti’s wife’s cake? In amongst them you’ll find the Bobbies, all bulging eyes, crocodile grins and Slenderman proportions, ever ready with a hat-tip and a “right as rain, sir, right as rain”. Venture outside at night, not that any true Englishman would ever violate curfew, and you’ll hear them whistling God Save The Queen as they comb the fog for undesirables.